Come rain or shine, Plastisol cladding is constantly exposed to the great British weather, and after a period (if regular maintenance audits are not conducted) it can look aged and grubby. 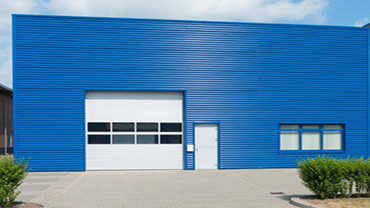 This article will look at the different types of metal cladding on the market and how to paint Plastisol cladding and get it looking like new again, whilst also increasing its life expectancy. Cladding is a protective and decorative exterior finishing system for building facades, exterior walls and roofing. Designed to protect the underlying structure – be it a business property, office block, warehouse or store-front – its colour scheme is often as important to represent brand as it is for protection of the building. Historically, cladding was made as a protective outer layer for a structure, out of cedar wood, stone, copper, brass or bronze. Asbestos cladding grew in popularity, until it was discovered to be very dangerous to human health. Cladding acts to safely and easily direct water or wind from a building’s structure – thus rendering it waterproof and weatherproof. It also acts to prevent noise from entering or escaping a property – soundproofing. 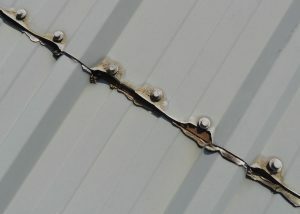 One of the most common problems for metal cladding is cut edge corrosion. If cut edge corrosion is all you’re looking to treat at present, then the Tor EdgeProtect™ System is an excellent product range to repair and restore the Plastisol and metal cladding surfaces without needing to coat the entire roof or wall surface. Cladding acts to safely and easily direct water or wind from a building’s structure – thus rendering it waterproof and weatherproof. It can also act to prevent noise from entering or escaping a property – soundproofing. 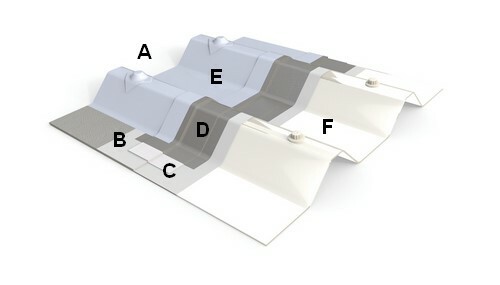 Dependant on general maintenance, severity of exposure to wind, rain or sunlight, and the condition of the structure around it – guttering for example – it is very durable and can last up to 50 years. Cladding paint can’t last this long, but the best high quality cladding paints can offer up to 20 years’ additional protection. Rawlins Paints has an extensive range of metal and Plastisol cladding paints, available in many colours – contact us for more bespoke colour options. Stone cladding – thin layers of natural stone, or an alternate cheaper simulate stone finish. This finish offers a natural and more elegant finish than other alternatives. Timber cladding – popular amongst many modern architects, timber cladding comes as horizontal boards, shingles or panels, with the grain also running horizontally – usually heavily sheened for contrasting effect. When painted correctly, it offers a rustic and visually striking appearance, and is also environmentally friendly. Weatherboard cladding – this option does require more ongoing maintenance to keep it in premium condition. Weatherboard cladding can be made from reconstituted hardwood or timber, and is generally stained, rather than painted. Fibre cement cladding – made by compressing sand, cement and cellular fibre into sheets, fibre cement cladding looks like wood, but is lighter and easier to install. Another plus point about fibre cement cladding is its low maintenance requirements. Brick cladding – brick cladding can be used to produce a standard brick wall finish, or a multi-coloured (and visually textured) mosaic effect that can make property extensions look spectacular. Easy to work with, lightweight and offering good insulating qualities, they are low maintenance and aesthetically pleasing. Vinyl cladding – available in lots of colours and very popular, this recyclable option can be fitted easily and is aesthetically pleasing on rustic detached properties. Metal cladding – generally used on commercial and retail premises, it offers a sleek and modern look (there are a full range of cladding paint colours available at Rawlins Paints). Steel and aluminium are the main metals used for metal cladding systems, and they offer durable and long-lasting protection to a property. Plastisol HP200 is easily recognised by it’s classic ‘leathery’ surface texture, this type of cladding has been available since 1987 (previous Mk.1 and Mk.2 versions were available from 1965 and had a similar appearance). 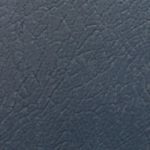 Plastisol HPS200 has a ‘dimpled’ surface texture, quite different from the traditional leathergrain Plastisol. This Scintilla pattern has a tiny ‘S’ impressed inside it, and has been available since 1998. These common types of cladding have no surface texture and are therefore easily distinguished from either types of Plastisol shown above. These different types of metal cladding surface require special consideration and in most instances will require a specific method of preparation and primer. These surfaces are usually easily recognisable by their ‘smooth’ appearance, however due to the nature of these cladding types we ALWAYS recommend our Technical Department is consulted for advice prior to commencement of works. *HP200 and HPS200 are registered Trade Marks of Corus UK Ltd.
Plastisol cladding is generally used to clad walls and roofs on industrial buildings, warehouses and retail units. It is made up of high quality galvanised steel sheets, with a primer paint layer and a top-level PVC coating rolled onto it. It is a very protective, decorative and durable method of protecting a building’s structure, and doesn’t scratch or fade easily. Plastisol itself is made of polyvinyl chloride particles in an emulsion, which are then heated to form and bond as a solid substance. All types of cladding have different (expected) lifespans, and Plastisol cladding should last for 30+ years – this is dependent on regular maintenance checks and cleaning. Plastisol corrugated metal cladding comes pre-cut into panels (or sheets), where in the manufacturing plant a protective coating is applied. Painting is considered a more cost effective option to replacing aged and discoloured Plastisol cladding. A new paint will add weatherproofing and waterproofing protection to it and the building structure it houses. Painted Plastisol lasts 10-15 years longer than untreated or un-coated cladding. Plastisol cladding can be spray painted and ‘re-branded’ very easily. Plastisol cladding is easy to install on a new build, or existing structure – such as a new shopping chain opening an outlet on a retail park previously inhabited by a different company. Partly due to this, and how easy it is to paint, Plastisol cladding is extremely popular as a ‘skin’ and can be seen on the biggest retailer and industrial properties, as well as on car showrooms. Plastisol paints, available at Rawlins Paints, are waterproofing and anti-corrosive, preventing rusting over time – and when repainted, due to Plastisol paints mainly being water-based, a business does not need to shut-down and can remain open whilst being re-painted. The biggest tip for it is to learn how to paint Plastisol cladding! Below are our general recommendations for the maintenance, repair and re-coating of metal clad industrial, warehouse and out-of-town retail units across the country subject to normal C3-C4 UV/atmospheric conditions. The entire area to be painted should be thoroughly washed and degreased via high pressure washing at a pressure of 3000-3500 psi. (approximately 200-250 bar). This water jetting operation should incorporate a 5% solution of Rust-Oleum Mathys ND14 Cleaner Degreaser and this cleaning solution must not be allowed to dry on the surface; whilst still wet, ensure that the cleaning solution and all resulting loosened contamination is removed via rinsing with copious amounts of fresh clean water. Any areas which have been noted to exhibit vegetative contamination are to be treated with Rust-Oleum Mathys AMW Fungicidal Wash. This should be liberally applied to the affected surface and allowed to act for 24 hours. After this period, the residue of the vegetative contamination is to be removed via dry brushing or water jetting depending upon applicator preference and site conditions. All rusted areas are to be mechanically de-rusted (with disc sander or mechanical wire brush) to achieve a cleanliness standard of St3, i.e. no brown rusting to remain visible. Where this leaves a “leading edge”, of existing coating, this should be feathered to a firm edge. Any areas of bare steel, galvanised steel, zinc and aluminium should be primed on the same day. After preparation (see Technical Data Sheet for full details) these areas should be primed with 1-2 coats as required of Rust-Oleum Mathys Metal Cladding Primer at an approximate theoretical coverage rate of 12.5m² per litre/per coat. Allow to dry for a minimum period of 1 hour at 20°C between coats or before overcoating. If more than 50% of the existing plastisol finish has been removed by the cleaning/preparation stage, this would be classed as a complete coating failure and ALL the existing plastisol should be removed back to a bare substrate and primed accordingly before proceeding. 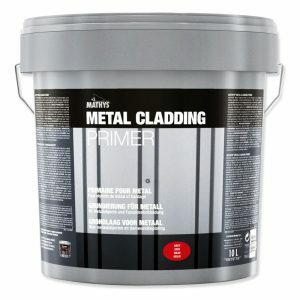 If desired, Rust-Oleum Mathys Metal Cladding Primer can be applied to the whole surface area (including intact, existing plastisol finish) to improve adhesion of Rust-Oleum Mathys Metal Cladding Topcoat, help prevent future corrosion and increase the overall life expectancy of the coating system. Other metal cladding types such as PVDF, PVF2, Polyester, Polyurethane, Power Coating, etc. require special consideration and in most instances will require Rust-Oleum Metal Cladding Primer to be replaced by Rust-Oleum PVDF Primer or other suitable Rust-Oleum Primer. These surfaces are usually easily recognisable by their ‘smooth’ appearance, however due to the nature of these cladding types we ALWAYS recommend our Technical Department is consulted for advice prior to commencement of works. 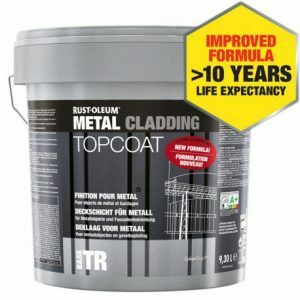 Apply 1 – 2 coats of Rust-Oleum Mathys Metal Cladding Topcoat as required to ready primed or directly to suitably prepared Plastisol HP200/HPS200 surfaces in any RAL, BS or NCS colour at an approximate theoretical coverage rate of 8m² per litre/per coat. Allow to dry for a minimum period of 8 hours at 20°C between coats. Although Rust-Oleum Mathys Metal Cladding Topcoat will be touch dry in 1 hour, full hardness will be achieved after 1-2 days. This is just one example of how you can treat and protect a metal clad surface, we have many different options from different manufacturers, increased life expectancy systems, special systems for cold weather application, roof waterproofing systems, etc. Metal cladding is a large area to cover in one article and we encourage our customers to contact us so we can offer bespoke advice and systems to suit your projects particular requirements, life expectancies and budget. Leave a comment below for any further information and resource on how to paint Plastisol cladding. Guidance given in this specification is given in good faith but without warranty. We have strived to cover as many scenarios as practically possible but we recommend our Technical Department is consulted before commencement of any works to ensure the correct specification is being adhered to for each project due to the wide range of varying circumstances, environments, substrates, etc. each job will encounter. The above-mentioned consumption is theoretical and is provided for indicative purposes only. Actual consumption is dependent upon site specific conditions and so can only be determined at the moment of execution of the work. The above specification assumes constant temperatures of 20°C during application, drying and curing. Deviations from this temperature during application and curing of the individual coats are possible (within the limits described in the Product Data Sheet) but may have consequences for overcoat periods etc. If in doubt, please refer to the relevant Product Data Sheet or to the Technical Department. The substrate must conform to DTU 59-1 i.e. be free of grease, oil, dust, dirt, etc. so that the adhesion of the coating is not negatively influenced. Old coating layers that are not to be removed must have a good adhesion with the underlying substrate. The above specification is made in good faith but without warranty. Any coating failures which are the result of conditions not within the control of Rawlins Paints are out of the scope of the Specification. The work must always be executed by a competent professional applicator, in full accordance with the Specification and with reference to the current Product Data Sheets as well as the current Material Safety Data Sheets. These are freely available upon request. This specification is subject to our general terms and conditions which are freely available on request. Please can you send me more information regarding Plastisol cladding paint. Material safety data sheet, how to apply the product etc. The cladding around the front of our building requires attention and this product looks ideal for our requirement. Hi. I have a query for you regarding painting the Plastisol cladding. What would you recommend if we were painting brand new sheets of cladding. Is there an etch primer for this ? Should it be sanded ie. to give it a key for primer and paint coating. I understand the cladding is available in different colours, however due to unforeseen circumstances we are now in a situation where we must paint the new sheets a different colour. The cladding once fitted will be exposed to harsh marine type environments, therefore I’m looking for a good solution to my problem. The main concern here is adhesion to the new shiny surface of the cladding. New and un-weathered Plastisol must be wiped with Bartoline White Spirit (for HP200) or 100 Rapid Drying Thinner (for HPS200) and allowed to dry prior to applying 2 coats of 902 HD Cladding Paint in the colour of your choice.